Scope of Work: Design, Financial Modeling, Brand Development, Procurement and Oversight. 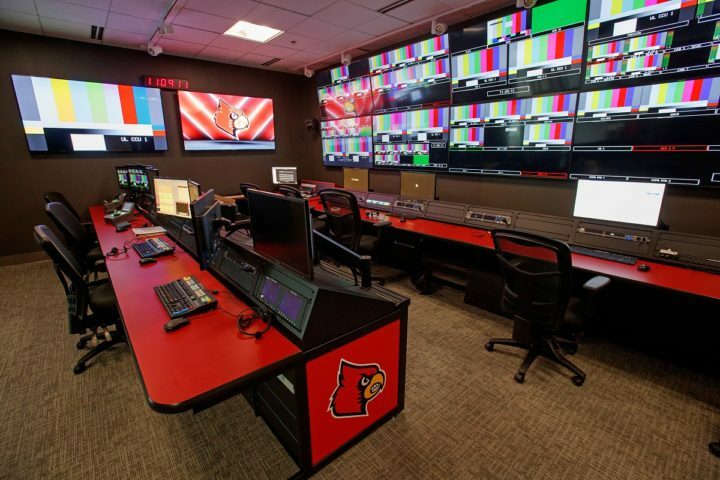 Anthony James Partners is thrilled to have worked with the University of Louisville to design, procure and oversee the construction and integration of one of the most advanced television broadcast studios in college sports. 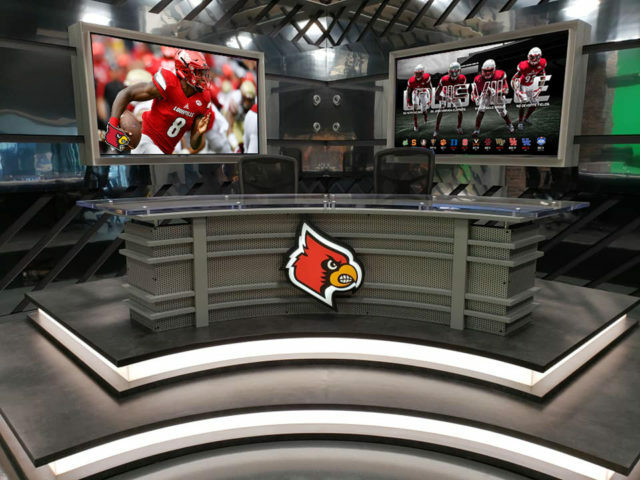 AJP worked closely with the University of Louisville Athletic Association to design a unique production facility featuring television studio that will enable live interviews on any ESPN platform and/or broadcast channels. The versatile studio, with variable sets and a full green screen wall, is housed in the facility along with new personnel work space, 5x control rooms, rack room, conference room and kitchen. The studio is equipped with 82 Television Monitors and 28 Cameras. The center will be used for creation of not only ACC Network content, but for other video projects in support of the athletics department as well. 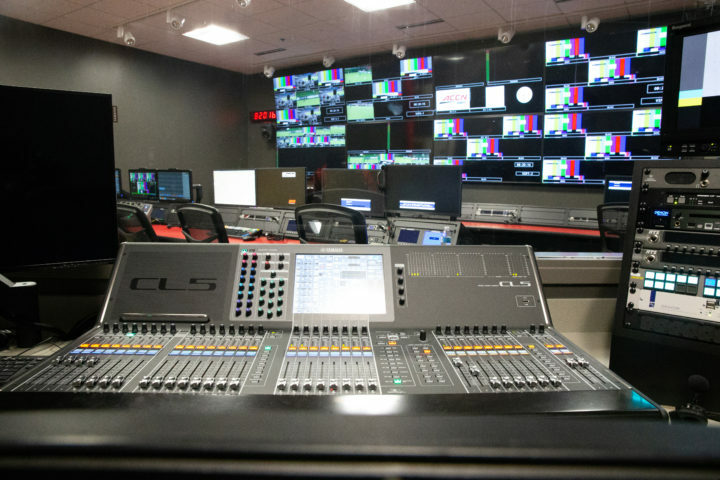 Equipped with two state-of-the-art full video control rooms, the new 7,850- square-foot University of Louisville Athletics Broadcast Center also houses three additional scaled back control rooms that allow for live telecasts of multiple events that may either overlap, or are concurrently played, to air on multiple television platforms. Instead of mobile trucks covering sporting events, live programming will be originated from the new centralized production facility. 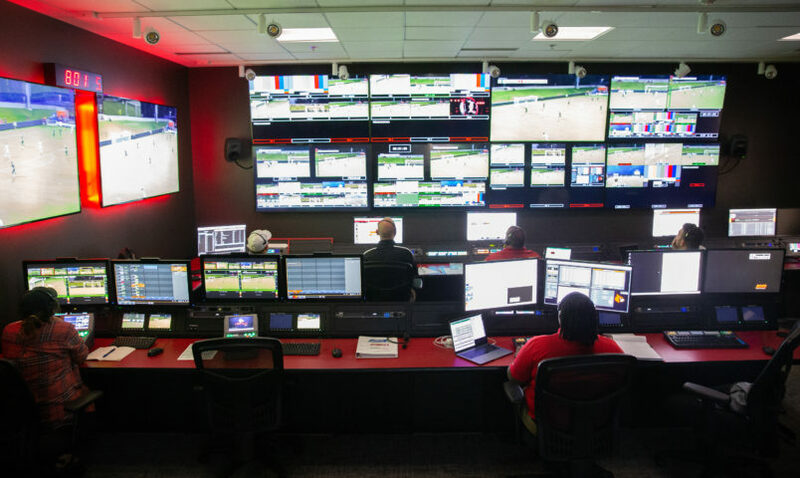 With fiber connections to each venue, the broadcast center will also produce live, in-game content for UofL venue video boards such as those in Cardinal Stadium, Dr. Mark & Cindy Lynn Stadium, KFC Yum! Center, Jim Patterson Stadium and Ulmer Field. The UofL Athletics Broadcast Center is connected by fiber to ESPN. The University of Louisville was going for a “wow factor” with the lobby of its recently completed TV production studio. And it certainly does wow. I toured the studio last week, ahead of today’s public unveiling, with Louisville Business First photographer Chris Fryer to get the lowdown on the $8 million facility at 1900 Arthur St., next to the FirstBuild facility on U of L’s Belknap campus. Our guides were Kenny Klein, U of L’s sports information director, and Jeremy Noe, the school’s executive director of television production. Stepping into the lobby, even with the lights off, was enough to overwhelm the senses. Visitors first see a sleek, modern, stainless steel covered reception desk with lighted logos of the ACC’s 14 schools on the wall above. To the right, a glass wall allows a view of the two live-television studios. To the left, a glass wall shows the control rooms, replete with dozens of monitors and controls. 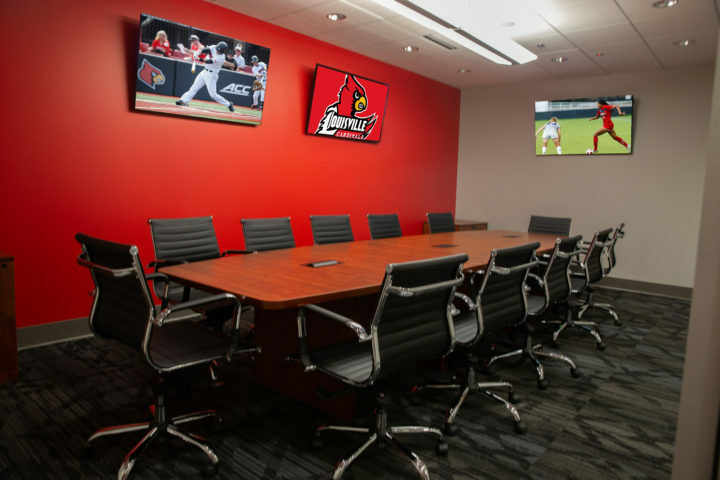 The facility will originate live programming for all U of L sports from all of its venues and will broadcast on-campus and to ESPN, ESPN2 and ESPNU. 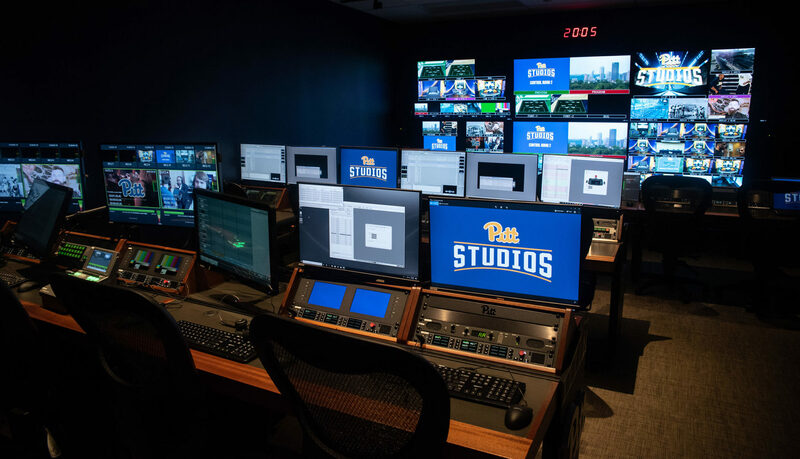 Eventually, the studio will be used for broadcasts on the ACC Network, a venture of the ACC and ESPN that is expected to launch by August 2019. The facility already is broadcasting games on the video streaming services ACC Network Extra and Watch ESPN+. All sports facilities and the ESPN network are connected to the studio by fiber optics. 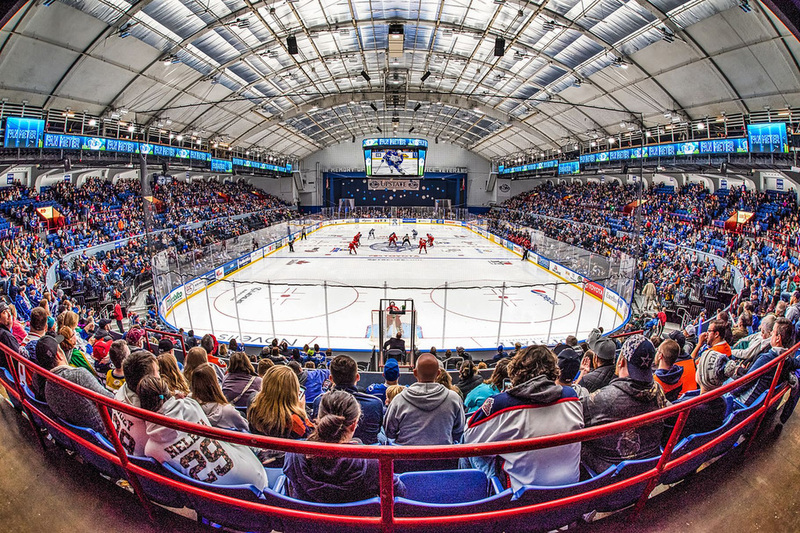 Although the total price tag for the facility was about $8 million, construction cost of the building, which formerly housed a metalwork shop, totaled about $2.5 million. The remainder was equipment, technology and network integration. Feeds from 28 cameras from all U of L athletic venues. The multiple control rooms allow the studio to simultaneously broadcast live events. The studio also has a room and broadcast equipment that ESPN will be able to control from its main studio in Bristol, Conn., for live local broadcasts. For the time being, the studio will focus exclusively on broadcasting live events, Klein said, and there are no plans for studio shows or other scripted programming. But content production requirements with the ACC Network have not been solidified, he said. 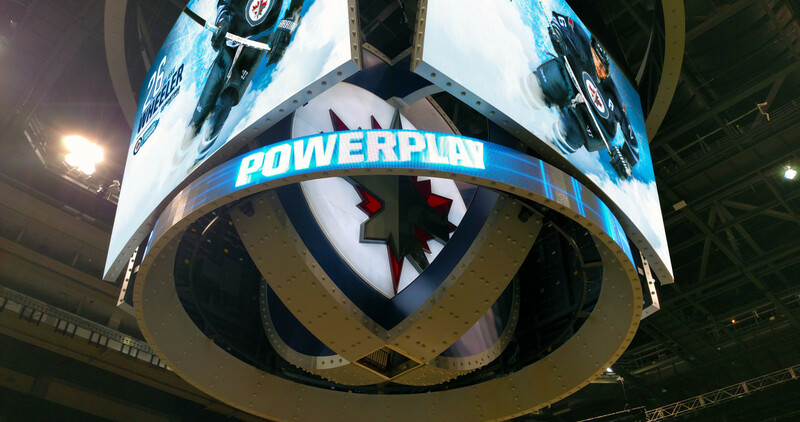 Other content in the near term could include live studio programming, such as coaches’ shows. Noe said the facility was in use even before construction was complete. As of Monday, the studio had broadcast 28 events. Looking ahead, Klein said the facility will broadcast 80 events in the fall and about 200 in the next year. The facility will be staffed by four full-time employees plus about 100 students and freelancers in the next year. U of L previously relied on a mobile broadcast studio to cover live events. Noe said that the school decided not to cannibalize the mobile studio for equipment and will continue to use it to broadcast events on campus. The studio even has a bit of advertising on the roof. Noe said the studio has a U of L Cardinal and Adidas logo on the roof that will be seen by planes flying into nearby Louisville International Airport. 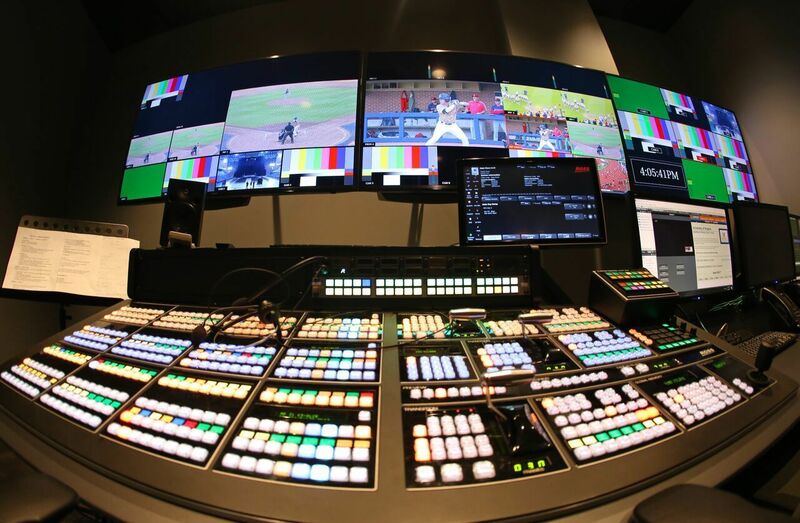 Louisville, Kentucky – The University of Louisville Athletics Broadcast Center opened its doors for a grand opening event on Monday at the television production facility located on the northeast corner of the UofL campus on Arthur Street adjacent to Interstate 65. The Atlantic Coast Conference and ESPN have partnered to launch the comprehensive linear and digital ACC Network in 2019. 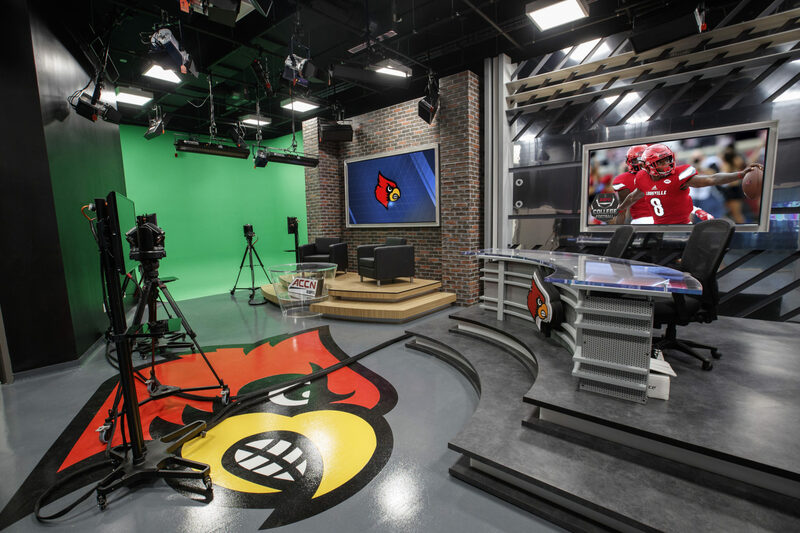 With the network launch approaching, UofL built a television production facility to house all the equipment and personnel that is necessary to originate live programming. 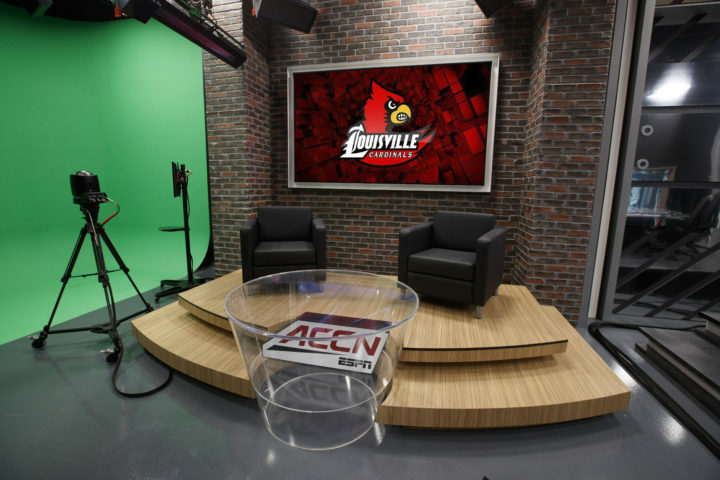 Until the linear network launch, live programming will continue to be produced by UofL for ESPN networks or ACC Network Extra, a digital television platform. The 7,850 square foot production facility was completed in September 2018 and is connected by fiber to UofL athletic venues and to ESPN. Instead of mobile trucks covering sporting events, live programming will be originated from the new centralized production facility. The $8 million project included construction, equipment and integration, and fiber connection to UofL venues. The broadcast center includes two full video control rooms for linear telecasts which will air on ESPN, ESPN2, ESPNU or the ACC Network. 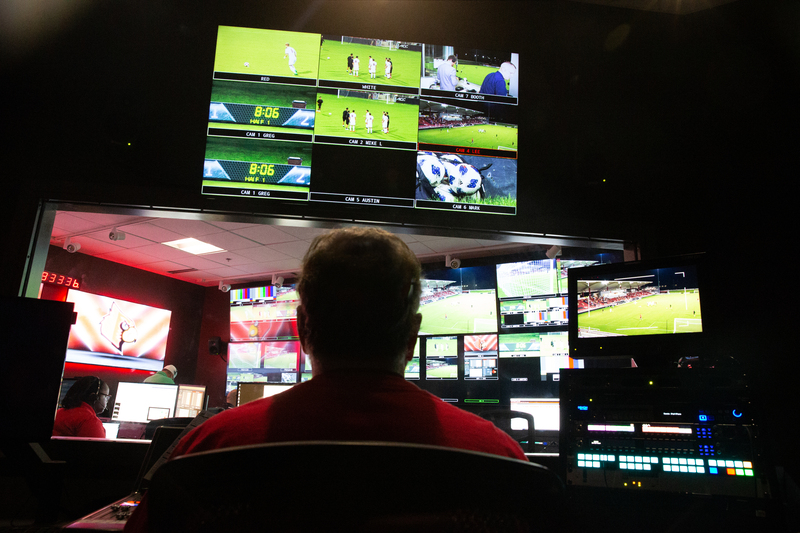 Those two control rooms and three additional scaled back control rooms allow for live telecasts of multiple events that may either overlap, or are concurrently played, to air on multiple television platforms. Within the facility, over 2,500 wires with a total length of 38.6 miles are installed to connect the comprehensive electronic equipment used to produce the events. 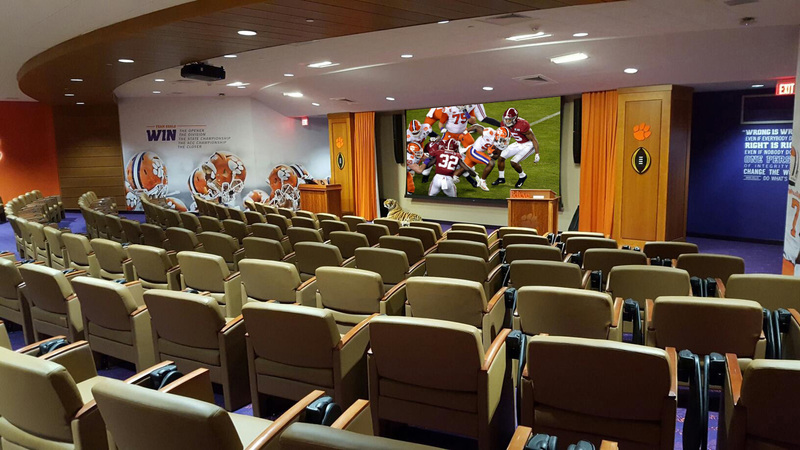 There are 82 television monitors throughout the facility. A total of 28 cameras available for field use: 10 primary, including four with 80x lenses; nine robotic; three POV; and six within the mobile production trailer. 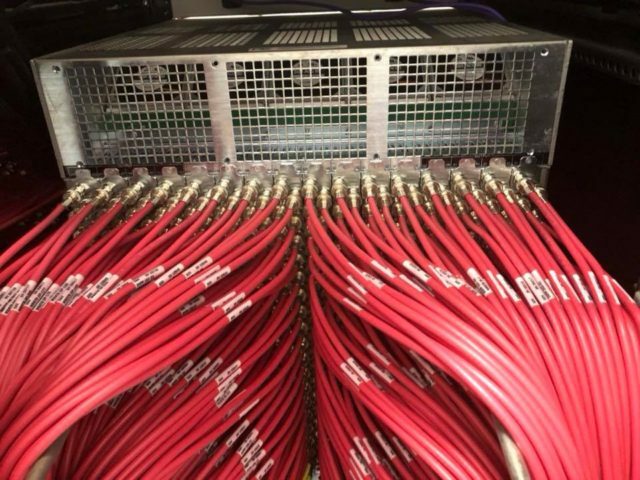 With 576 strands of fiber connecting the broadcast center to venues, the center will also produce live, in-game content for UofL venue video boards such as those in Cardinal Stadium, Dr. Mark & Cindy Lynn Stadium, KFC Yum! Center, Jim Patterson Stadium, Ulmer Field and other venues. The UofL Athletics Broadcast Center is connected by fiber to ESPN. 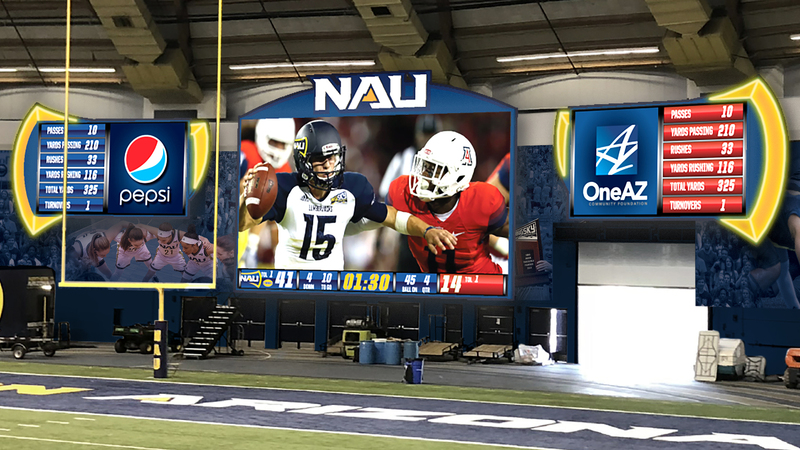 The production facility will include a bureau studio, which will allow coaches and players to do live interviews on any ESPN platform or broadcast channels. 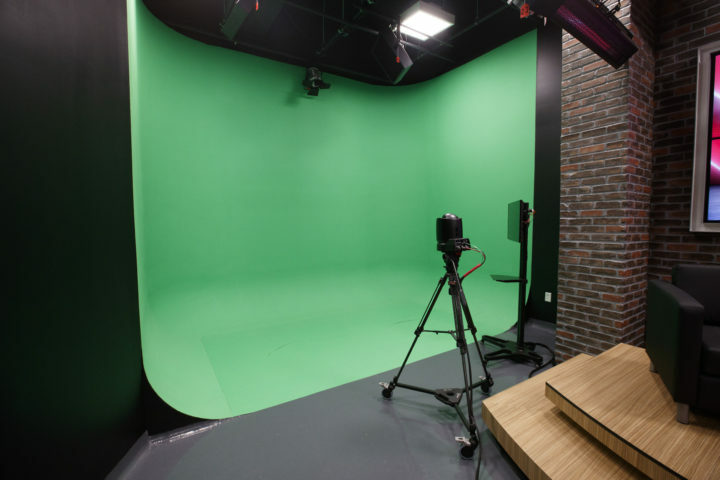 Also included in the center is a versatile studio with variable sets and a full green screen wall, as well as work space for personnel. The Cardinals also maintain a television production mobile unit for venues that are not connected by fiber to the broadcast center. The broadcast center is staffed by a full-time crew of four and nearly 100 freelance and student workers that contribute over the course of the year. Two additional full-time staff members will be added next year before the launch of the ACC Network.